In this section you can find many different books that help in understanding the message of the Bible. We present these books for free and in different formats for online reading (HTML) or printing (PDF). Our Radio Programs in the Arabic language have been broadcasted for many years. They give answers to essential questions of spiritual and daily life issues. These programs have been prepared and presented by well-known believers in the Arabic world. 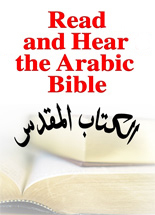 In our music library, you can find spiritual songs in Arabic and English. You can download all MP3 and Real Audio songs for free and share it with your friends. 1999-2010 Call of Hope - All rights reserved.